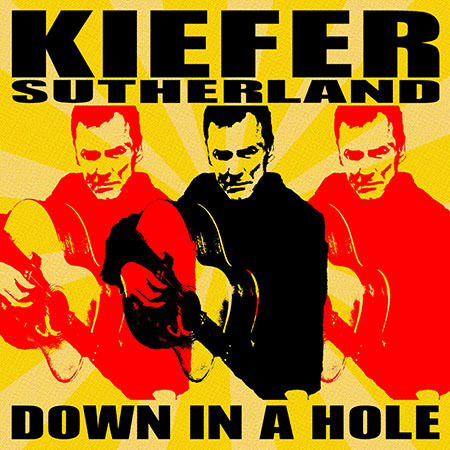 NASHVILLE, Tenn. (August 5, 2016) – Kiefer Sutherland will carry the momentum from his live shows to retailers August 19 with the upcoming release of his debut album Down In A Hole, available forpre-order now from Warner Music Nashville/Ironworks Music. A special edition vinyl LP will be available exclusively at Barnes & Noble August 12 (click here to pre-order). Sutherland recently wrapped up a North American tour where he sold out venues across the U.S. and Canada. His soulful baritone vocals and guitar licks continue to captivate audiences with his second music video, “Can’t Stay Away,” which premiered exclusively on CMT’s Hot 20 Countdown (click here to watch). “This record is the closest thing I’ve ever had to a journal or diary. All of these songs are pulled from my own personal experiences. As much as I have enjoyed the writing and recording process, I am experiencing great joy now being able to play these songs to a live audience, which was something I hadn’t counted on,” Sutherland said of Down In A Hole. Earlier this year Sutherland gave fans a taste of his songwriting notebook when he released the pedal-steeled “Not Enough Whiskey.” Sutherland co-wrote every song on the upcoming 11-track album with producer Jude Cole. Sutherland, an Emmy and Golden Globe Award-winning actor, is known for his starring role on the Fox series "24," starring roles in movies like ‘Stand By Me,’ ‘The Lost Boys,’ ‘Young Guns,’ Flatliners,’ and many more. Sutherland’s upcoming ABC series “Designated Survivor” premieres this fall on ABC.